Some people have an easy time making decisions. And I’m not talking about decisions such as, Should I eat dessert today? or, Do I want to move to a warmer climate for the winter? Yes and yes. Those decisions are no-brainers. I’m talking about the decisions that affect the quality of your life…but not so much in a physical way like warm or cold weather. Or calories and how your clothes fit. the mental anguish of observing something that you have absolutely NO control over! Like choosing a favourite hockey player and then watching them have a horrible game. Or get traded to a team you hate. At the last card show I was at, I decided I had to pick my favourite player. I had to make a decision. Last season when I started collecting hockey cards for the first time ever, I couldn’t decide on one single player. At times, it was Nikolaj Ehlers. Then it was Mathieu Perreault. I have multiple cards of both players. Mark Scheifele is a good player. So is Blake Wheeler. But they both have lots of cards! Paul Stastny sure lit up the second line when he joined the Jets and it was neat to look at the generation of hockey players who had come before him. Brandon Tanev is fun to watch and Hellebuyck was fantastic last year! Clearly, I had settled on decision #1 of How To Pick Your Favourite Player. Will you decide to collect a player from your favourite team? Do you even have a favourite team? For me, my favourite player was going to come from – and hopefully stay with – the Winnipeg Jets. One decision down and it was, fortunately, a no-brainer for me. You might choose to collect someone that’s not necessarily from your favourite team. Top goal scorer? I’ll state the obvious and suggest you should probably pick a forward. My final decision had nothing to do with position or goals scored. Speaking of top scorers, I don’t envy the Laine fans out there who are agonizing over his supposedly “lack-lustre” season. Would I be miserable if my favourite player was having a substandard season? Yes!! That’s exactly what I was referring to at the beginning of this article. One of the nice things about choosing a favourite player or choosing who to collect is that you can be as random and senseless as you want to be. Position and goals didn’t matter to me, but I wanted to pick a player who was hard working and humble. And, while Byfuglien is entertaining to watch as he breaks up fights and pulls players out of pile-ups by the pair, I admire the player who stays focused on the puck. I’m not one to jump on any bandwagon. No thank you, Keto diet. I’m not buying your book or watching your show, Marie Kondo. I know that Patrik Laine and Dustin Byfuglien are probably the top two favourites among Winnipeg Jets’ fans. There’s nothing wrong with that but I wasn’t about to pick either of those players to collect just because everyone else is. Another no brainer for me. Then there are hockey players who transcend their team. They epitomize hockey. Or Wayne Gretzky, but I’d personally prefer to collect a current player. The bonus to being on the bandwagon is that, if you choose to collect a popular hockey player, you can find their cards and other collectible items a lot easier. In fact, there will be MORE of their stuff everywhere, even at Walmart. Maybe owning a jersey with your favourite player is important to you. It’s part of your collecting process. I personally recommend looking for jerseys at Uptown Sports or Superstars Sports. If you want to find a jersey of your favourite player’s name on it, you’d be wise to select one of the more popular players. Aside from Laine and Byfuglien, I know there are lots of bobble heads, jerseys, and collectible items of Mark Scheifele, Blake Wheeler, and Jacob Trouba. To me, having a blank jersey with no name other than that of my favourite team would be good enough. Speaking of jerseys and high end collectible cards, the player whom you collect should be within your budget. 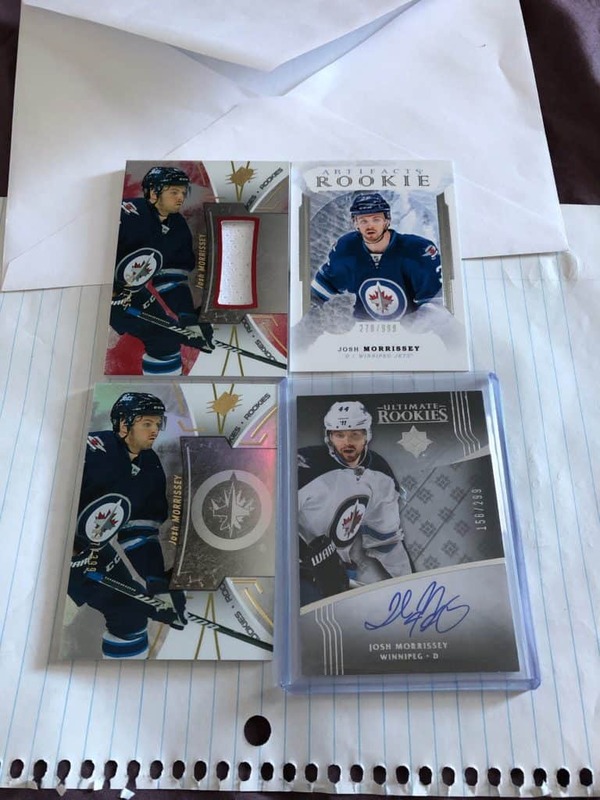 My 13-year-old son decided to start collecting Patrik Laine cards last February (2018). He has a collection of about 38 Laine cards, ten of them being base cards. The rest are mainly inserts and rookie cards, with a few affordable jersey and autograph cards. Some of these he obtained at card shows, sometimes by trading with other collectors. However, the price of Laine cards has gone up. So much so that my son has chosen to collect a different player. He’ll still keep his Laine collection for now though. My 10-year-old has collected Sidney Crosby AND Kyle Connor cards for about a year. 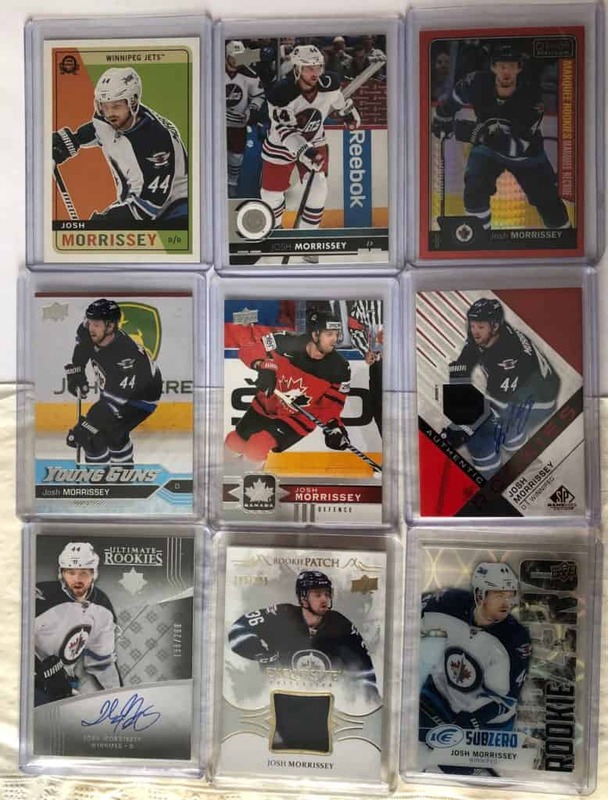 His Crosby collection is close to 100 cards without him spending much money on it at all. His Connor collection is much smaller. Kyle Connor cards are not nearly as common as Crosby cards are, for obvious reasons. Which brings me to another point within this point. If you decide to collect cards of a player who’s been around for a while, like Sidney Crosby, is it even possible to ever find all of their cards? Some people may appreciate the challenge but I’d rather go with a player who’s been in the NHL for only a couple of years at best. Again, this is another one of those personal decisions. If you have an unlimited budget and the time and patience to search for all of a certain player’s cards, then go for it! Does it matter to you where your favourite player was born? Your home province or state? As I was contemplating some of the hockey players who were in the running for MY favourite player, I realized that picking a Canadian-born player was important to me. It’s not important for everyone, and that’s fine. For me, hockey is Canada’s sport, no matter what other countries like to say. So my favourite hockey player would be born in Canada. 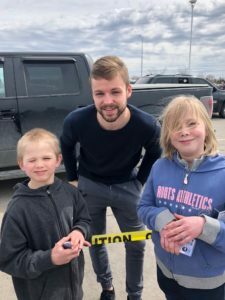 Back in spring, my family and I went to watch a Winnipeg Jets’ practice. Afterwards we hung out in the parking lot to see if we could get some players’ autographs. Some of the players didn’t take the time to greet their fans and I get that. I’m not sure how I would feel about dealing with fans. Or maybe they had places to be and families to see. No judgement from me. However, there were about 10 or 12 Jets players who stopped and gave us half an hour of their time. 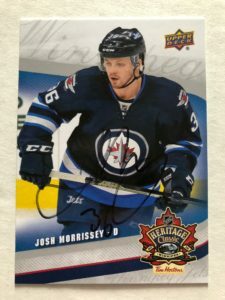 One of the first players out the door was Josh Morrissey. As I watched him interact with the kids and adults alike who asked for his autograph, I heard him ask each person one or two questions. And he asked like he wanted a real answer. Most kids didn’t pay attention to what he said – all they wanted was his autograph. But I observed Josh for a while and got the impression that he’s a pretty humble guy. I think his mother would have been very proud of him. 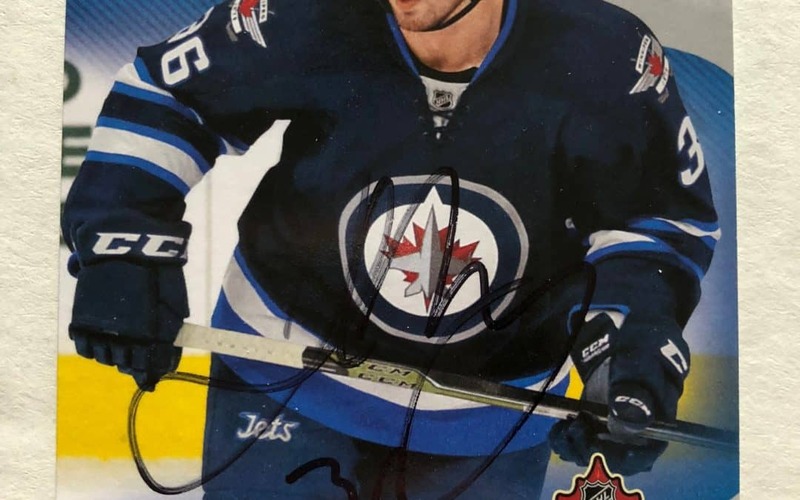 I got an autograph of my favourite player. When it comes to playing hockey, Josh Morrissey is not a fighter and as much as I like watching Brendan Lemieux pull off his gloves to throw some punches or Dustin Byfuglien crashing someone into the boards, I’d rather watch clean, fast hockey. I’m not sure what it is but I like Morrissey’s style. He’s a hard worker and not afraid to take a hit. What more can you ask for from a hockey player? Here are a few cards of my small Morrissey collection. Hockey cards make a great birthday present! What are your reasons for picking the particular player or players that you collect?